The below list shows a variety of phone socket types and shows if they are compatable with the BT Wholesale Interstitial Plate. Check to see what kind of socket you have. LJU2 Single socket measuring 68mm x 68mm with a non-split faceplate. Often found on old telephone wiring or as an extension socket. This example is unbranded. LJU3 Single socket measuring 85mm x 85mm with a non-split faceplate. Often found on old telephone wiring. This example has the BT Piper logo in the top left corner. LJU5 Dual socket measuring 85mm x 68mm with a non-split faceplate. An LJU4 is used for to provide two separate phone lines on a single socket. An LJU5 gives one line with two sockets. This example has the BT Piper logo in the top left corner. 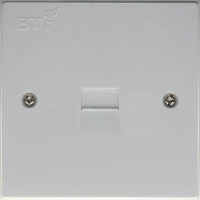 NTE5 Single socket measuring 85mm x 85mm with a split faceplate. This is an NTE5 master socket with a removable lower plate that can be used with an ADSL faceplate or an I-Plate. This is an unbranded generic version. 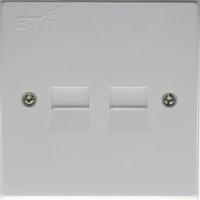 NTE5 Single socket measuring 85mm x 85mm with a split faceplate. This is an NTE5 master socket with a removable lower plate that can be used with an ADSL faceplate or an I-Plate. 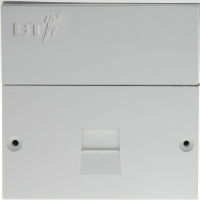 This version has the BT Piper logo in the top left corner..
NTE5 Single socket measuring 85mm x 85mm with a split faceplate. This is an NTE5 master socket with a removable lower plate that can be used with an ADSL faceplate. This is an Openreach version that already has the functionality of an I-Plate built in. ADSL v1.0 Dual socket measuring 85mm x 68mm with phone and DSL connector. 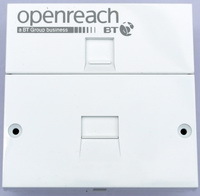 This is a filtered ADSL face plate which allows you to plug in your phone and ADSL into an NTE5. It isolates the extensions wiring from the DSL connection and therefore doesn't need an I-Plate. 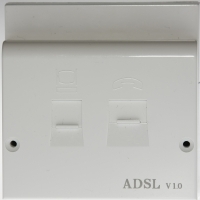 VDSL Interstitial Plate Dual socket measuring 85mm x 85mm (increases socket depth by 12mm) with phone and VDSL or ADSL connector. This is a filtered face plate that fits in the same manner as the I-Plate but provides a filtered socket for ADSL2+ and VDSL services. The extension wiring is isolated from the DSL signal, and faceplate includes external filtered connectors for a data extension if required. 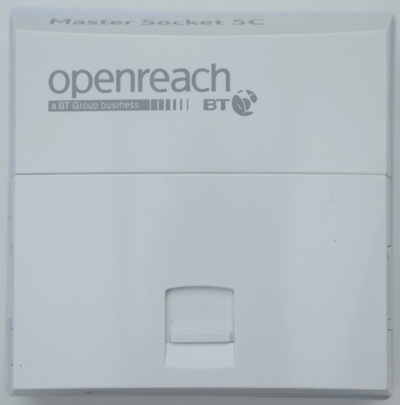 The latest style of master socket from Openreach, the backbox usefully references the 5C designation. 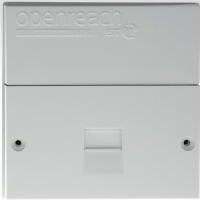 The curved style means it is not compatible with older after market faceplate filters, but Openreach does have a filtered faceplate available. The new socket is often referred to as tool-less since it uses simple push fit connectors removing the need for a Krone tool to push the wires into place.